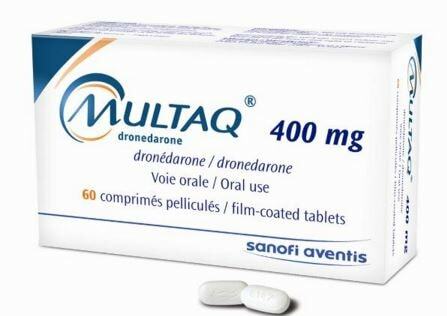 Multaq with the generic name of dronedarone, is an antiarrythmic medication. It is an alternative treatment to amiodarone used for the management of atrial flutter and atrial fibrillation in those who received electric sock treatment to maintain the normal heart rhythm or those who have returned to normal heart rhythm. The mechanism of action of Multaq involves the inhibition of the potassium and sodium channels thereby reducing the pacemaker potential in the SA node leading to a normal heart rhythm. Multaq is advantageous over amiodarone because it does not contain the iodine moieties in amiodarone that may lead to thyroid disease, pulmonary fibrosis and liver disease. It also contains methylsulfonamides, which reduces the neurotoxic effects of the drug by limiting its solubility in fats. It also has a relatively shorter half life of 24 hours than amiodarone with a half life of several weeks. Due to this, dronedarone dosing is much less complicated than the dosing of amiodarone. Since Multaq works by affecting the sodium and potassium channels used for triggering the action potentials in the heart, it may lead to further aggravation of heart failure due to decreasing the myocardial contractility. It should not be used in patients suffering from certain types of heart failure as discussed earlier because of possibilities of deaths as Multaq side-effects. The inhibition of the potassium and sodium channels may also slow down the heart contractility leading to a heart rate less than 60 beats per minute. It should not be given to patients with heart rate less than 60 breaths per minute to prevent serious bradycardia. Hypokalemia is a possible Multaq side effect due to inhibition of the potassium that goes into the blood from the cells. It is further aggravated by potassium depleting diuretics. The serum creatinine is observed to increase by 10% within 5 days of Multaq initiation. Nausea nod vomiting are also common Multaq side effects. This is due to initiation of treatment and it usually subsides after several weeks of therapy. Diarrhea is also a possible Multaq side effect. Up to 9% of people taking Multaq may experience diarrhea. The serum potassium should be checked because diarrhea may worsen hypokalemia. Multaq has been observed to increase the incidence of hepatocellular liver injury. The serum bilirubin and liver enzymes are also increased as a result of hepatic damage. Jaundice may be seen in patients who start to develop liver disease. Jaundice may involve yellowish skin, sclera and mucous membranes. There may also be presence of rashes, pruritus, dermatitis and eczema as a result of Multaq therapy. These interstitial lung diseases are also possible side effects of Multaq use. These Multaq side effects should be monitored in patients taking the medications to prevent respiratory compromise. Since it is possible for you to develop these Multaq side effects, it is better to inform your health care provider regarding any symptoms you may be experiencing to rule out possibilities of serious organ damage. Make sure to take Multaq as prescribed and never adjust the dose on your own.